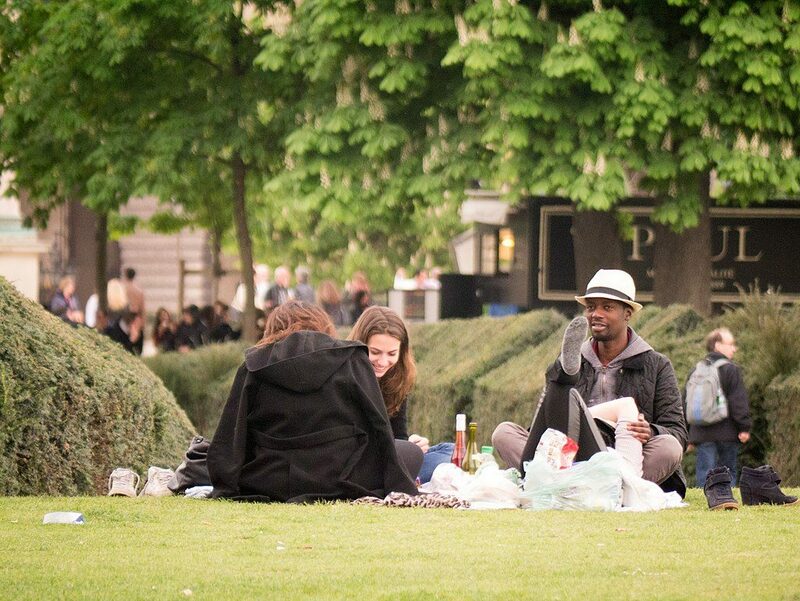 Like they do with pretty much everything else, Parisians make a true art of the spring or summer picnic. It’s not just a quick meal on the grass or a bench– it’s an event. 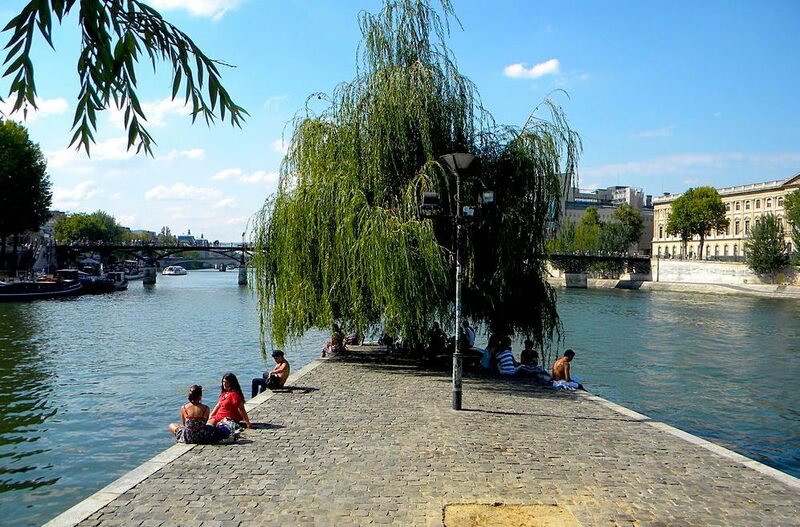 The best spots for picnics in Paris range from formal parks and gardens to riverside quays and quiet little squares. 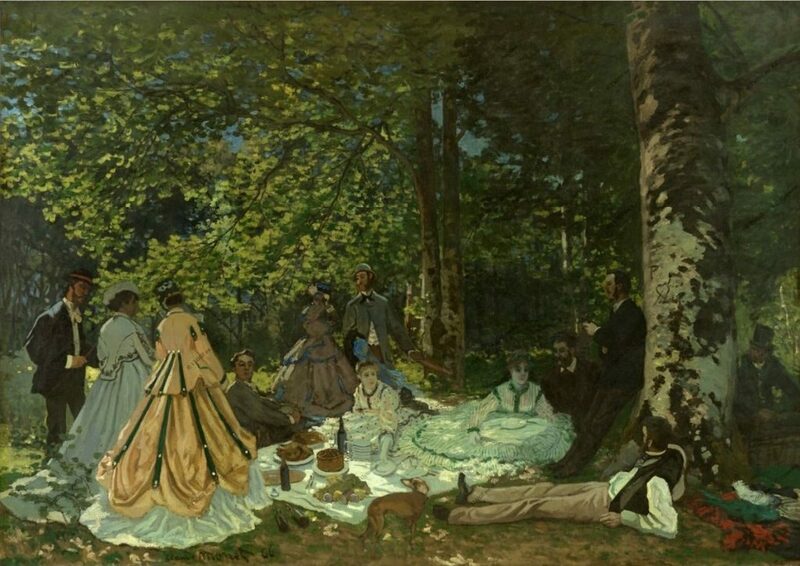 Claude Monet, Déjeuner sur l’herbe. Around 1866. Public domain. If you’re wondering where to potentially perch for your own pique-nique– incidentally, the English word comes directly from the French–keep reading. I also offer a few tips on how to stock up on delicious goodies for your open-air feast, even if you’re on a limited budget. Where to Find High-Quality Picnic Goodies? Riverside picnics on the banks of the Seine. Image: Nicolas Vigier/Some rights reserved under the Creative Commons 2.0 license. Any place with pedestrian walkways along the Seine can make a good spot for a picnic, but some are more coveted than others. 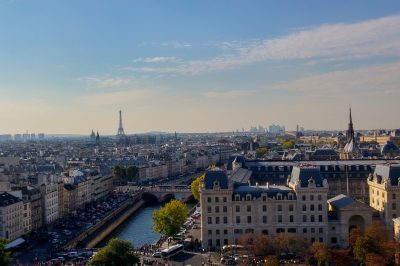 The semi-natural island known as the Ile St-Louis, the quays around Notre-Dame Cathedral and nearby the Pont des Arts are particularly popular. Make sure to arrive early: in late spring and summer these quays are teeming with people. Note: The Pont des Arts is a pedestrian-only bridge that’s itself popular with picnic-goers during the warmer months. 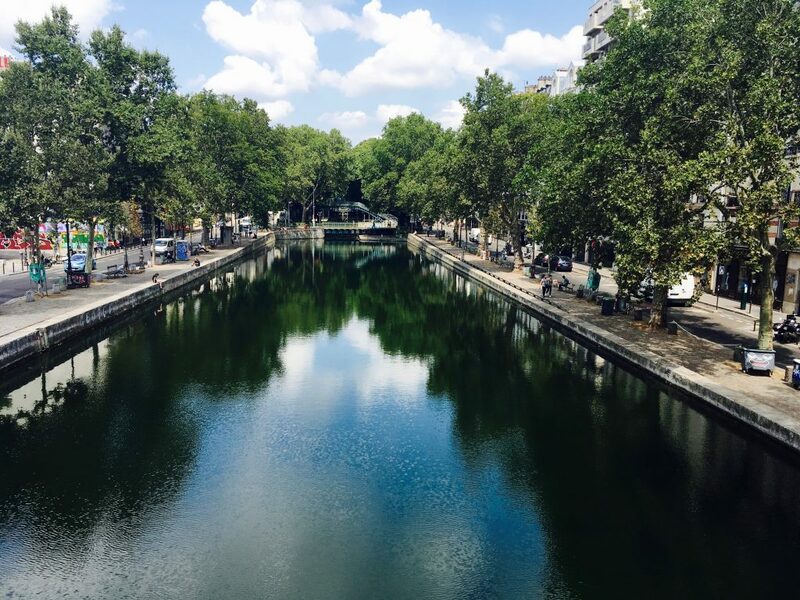 Heading northward to the right bank, consider having a picnic on an entirely different body of water: The Canal St-Martin. This former shipping canal is today a trendy hub lined with restaurants and cafes, street art and galleries. During the summer, it’s positively packed with people– some enjoying beer in cans, others feasting on an elaborate spread. You can even get pizza delivered directly to your elected spot on the canal from a place called Pink Flamingo. How’s that for a local experience? 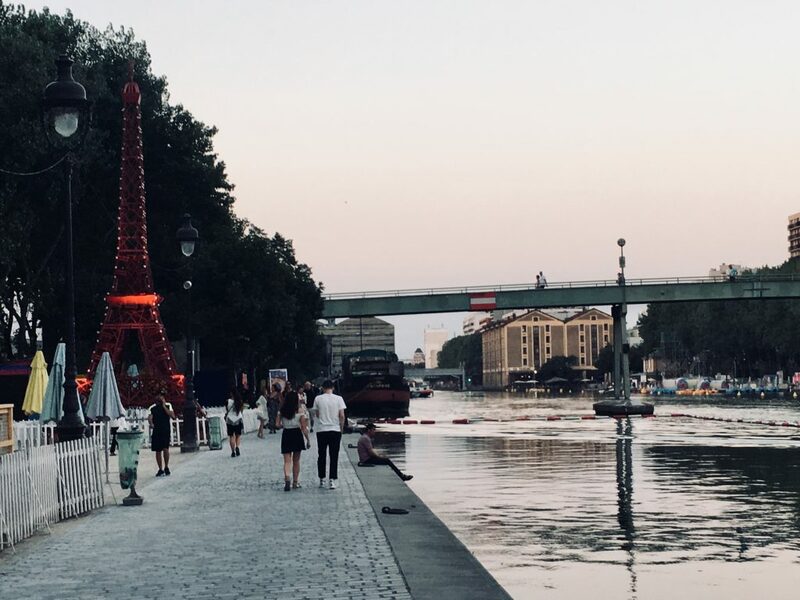 If you continue northward along the Canal St-Martin and cross the enormous boulevards near the Stalingrad metro station, you’ll eventually get to the Bassin de la Villette. This is one of the liveliest new centers of social activity in east Paris, and in the summer it’s packed with people throughout the evening. If you can get a spot, have a picnic by its banks as you watch the sun go down. During the annual beach operation known as Paris Plages, you might even be able to rent a paddleboat and dine onboard, floating along the admittedly murky waters and taking in the scenery. On a warm, sunny day, the prospect of stretching out in a fluffy patch of grass is nearly irresistible. Paris certainly has its share of idyllic parks and gardens, full of winsome paths, brightly colored blooms and expertly manicured lawns. The only trouble? Many lawns in France are off-limits. Look for signs reading pelouse interdite (Lawn forbidden) or pelouse en repos (literally, the lawn is resting) to figure out which ones you should stay off of. It’s not unusual to be reprimanded for breaking this oh-so-French rule, so beware! 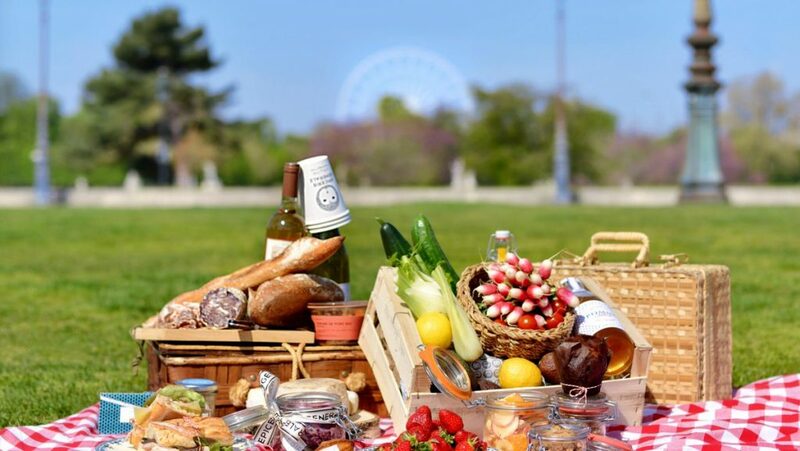 At gorgeous formal gardens such as the Jardin des Tuileries and the Jardin du Luxembourg, there are one or two lawns that you can picnic on. Otherwise, you’ll have to content yourself with sitting on a bench, perching next to a fountain or pwot pulling up an iconic metal chair or two. 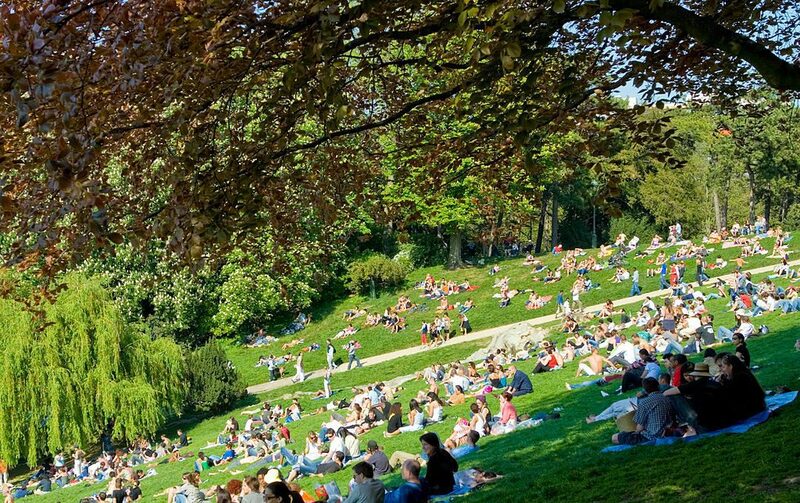 The Parc des Buttes-Chaumont, situated in northeastern Paris near the offbeat Belleville District, is a favorite perching ground for humans and birds alike come spring and summer. The romantic-style park, built in the 19th century atop limestone quarries, has the advantage of almost limitless grass. 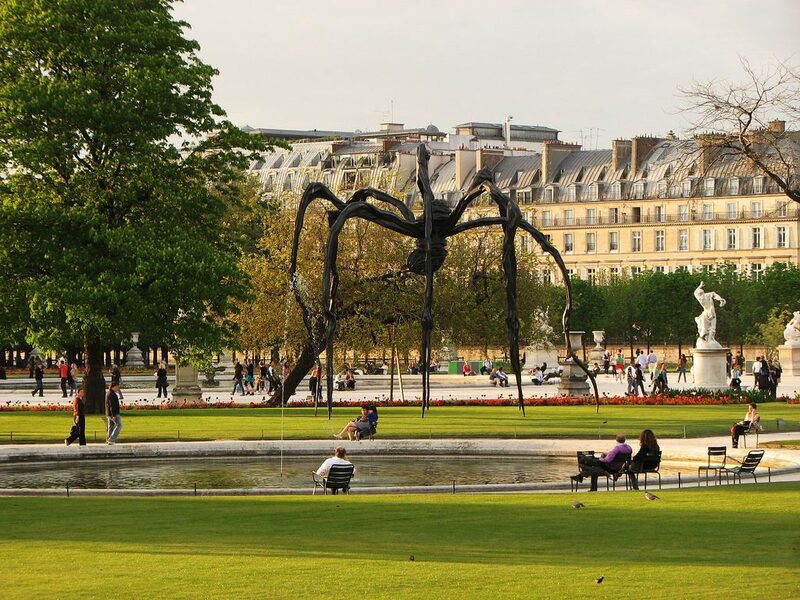 You can walk, play or sit on most of it, too, in contrast to places like the Tuileries and the Luxembourg gardens. As elsewhere, arrive early to grab a spot: the park is enormous, but residents take up every inch of grass and it can be challenging to find adequate space. This is especially true on weekends. 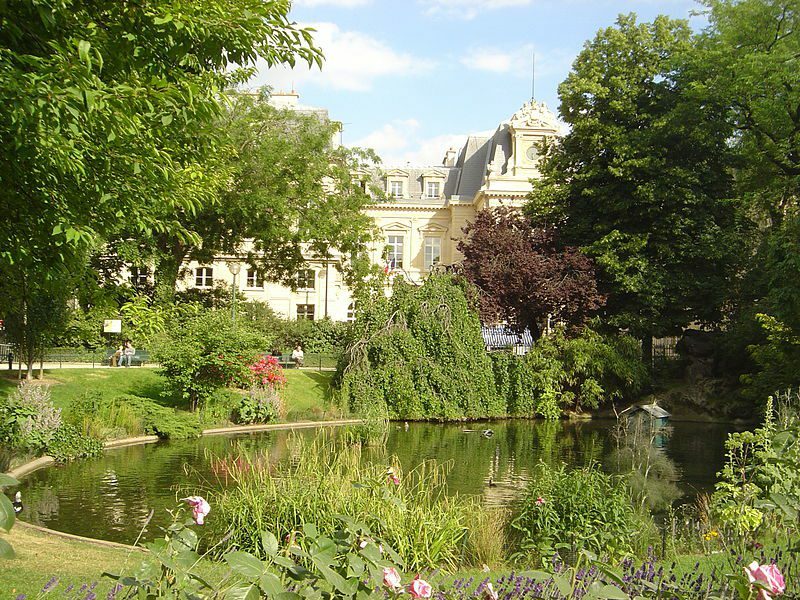 Also lovely is the Parc Monceau in western Paris, situated in the leafy 16th arrondissement. 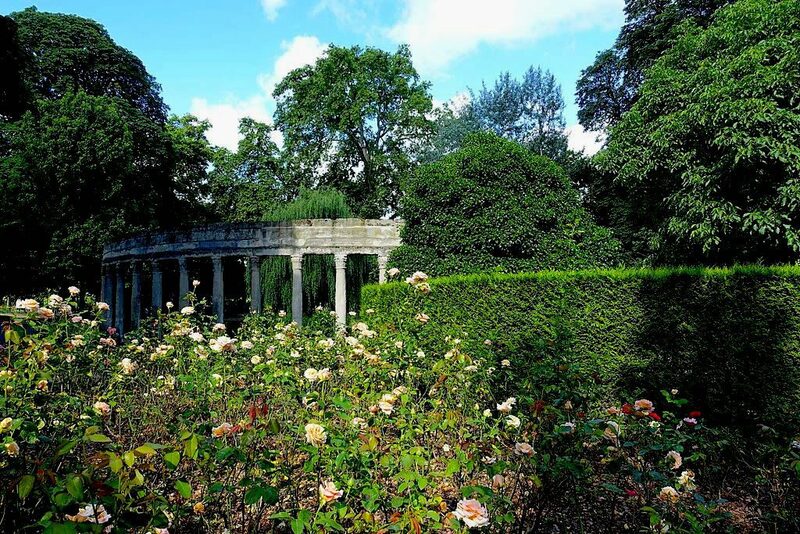 Statues, lush flowers, hundreds of trees and open lawns offer space for an idyllic lunch or dusky picnic. The Parc de la Villette, although a bit remote, is an excellent place for a picnic, especially with kids. It’s got sprawling lawns to sit on, quirky gardens and fun playgrounds to explore. 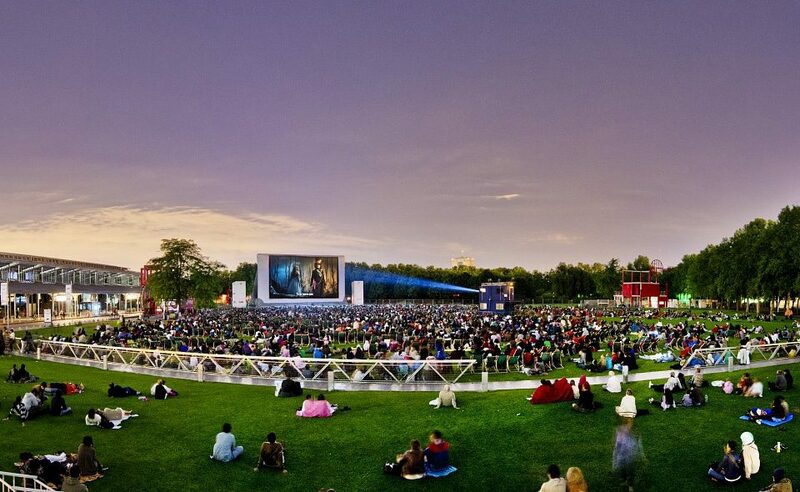 In the summer, enjoy open-air cinema most nights of the week– and bring your own dinner. Entry is free. 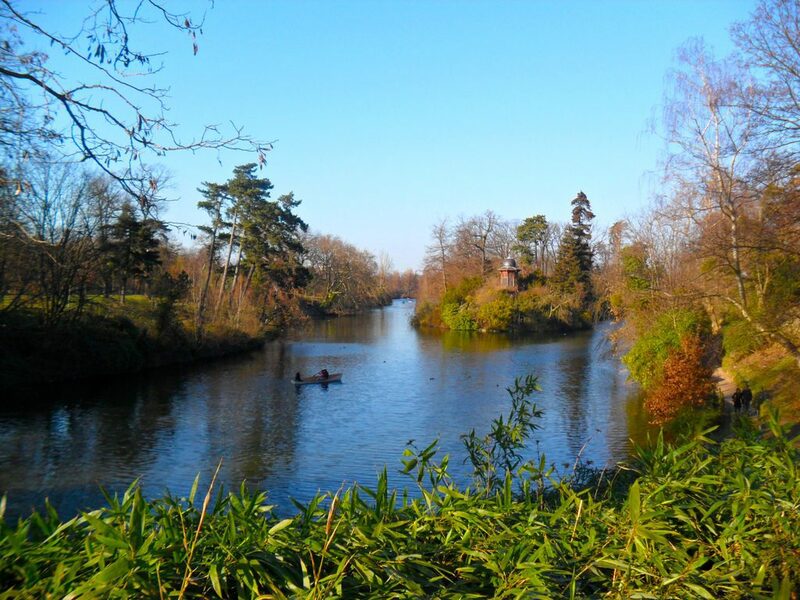 The Bois de Boulogne is one of two forested parks referred to as “the lungs of Paris”. 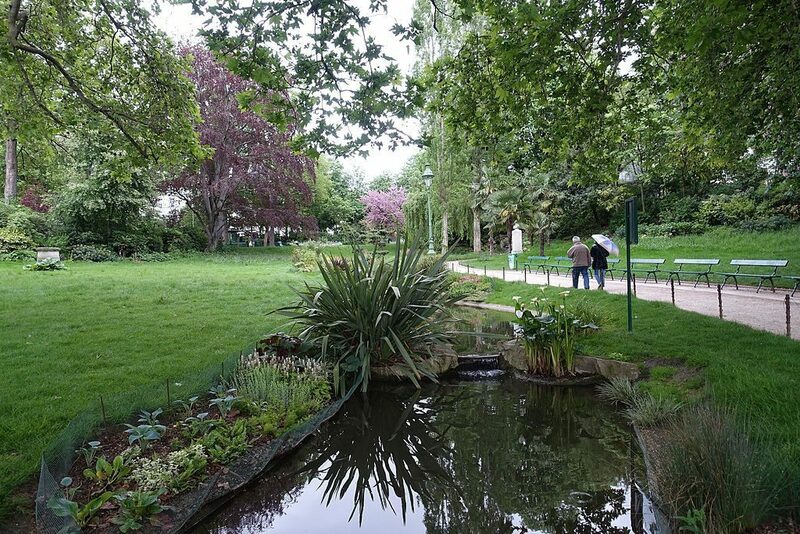 Finally, the Bois de Boulogne at the edge of west Paris is a genuine green belt, complete with enormous lawns, wooded paths and man-made ponds. Hire a boat or stretch out on the grass. The Bois de Vincennes directly east of Paris has similar charms in store. Both are only a short metro ride away from the city center. For more parks & gardens ideal for sprawling out in, see this full guide to some of the city’s loveliest. Not to be discounted are Paris’ many elegant, aesthetically pleasing squares. While you do still have to pay attention to the aforementioned “resting lawns” and refrain from sitting on those where you’re warned not to, they can be idyllic spots for a break. 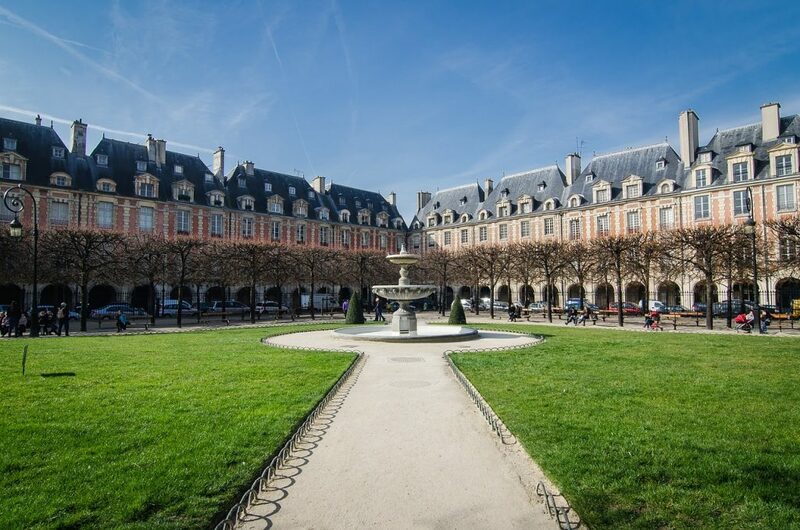 The Place des Vosges (pictured above), a 13th-century formal royal square surrounded by mansions and punctuated with fountains. 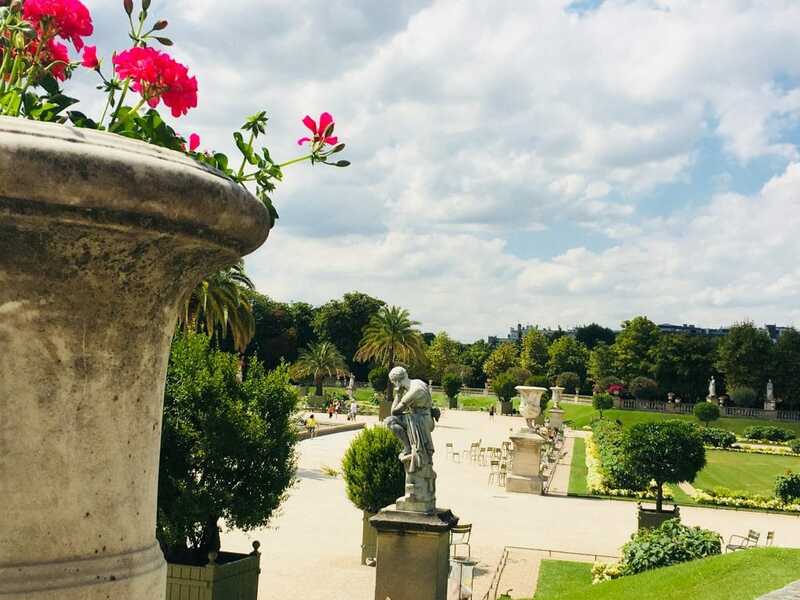 The lawns here are generally accessible, and it’s a fantastic place to casually nosh on falafel, gelato or bakery goods from the adjoining Marais neighborhood. 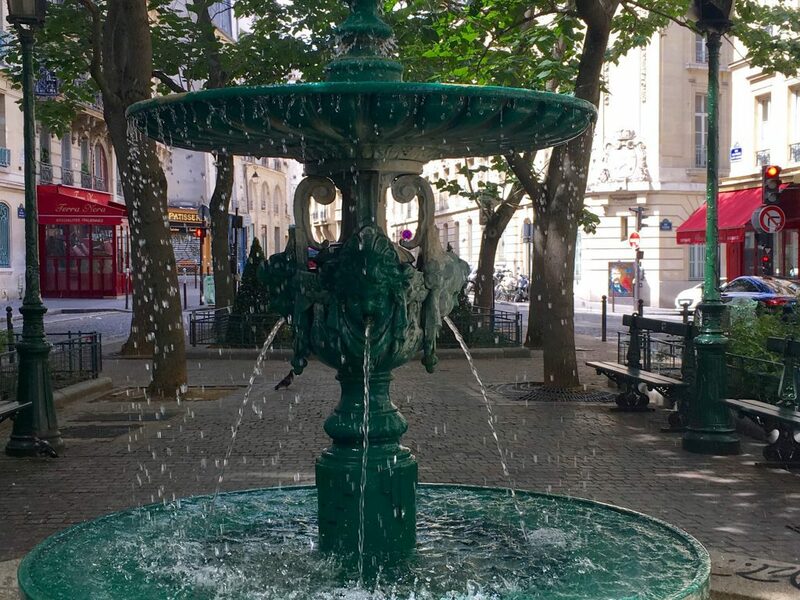 Nestled in the 3rd arrondissement outside the district’s city hall, the Square du Temple (Metro: Temple) is a little-known haven away from the crowds of the Marais and the Centre Pompidou. 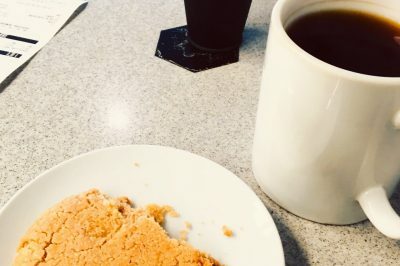 There are many excellent bakeries in the area (see my tips below on where to find them) and while you have to perch on a bench rather than on the grass, this is a wonderful place to take some time out. 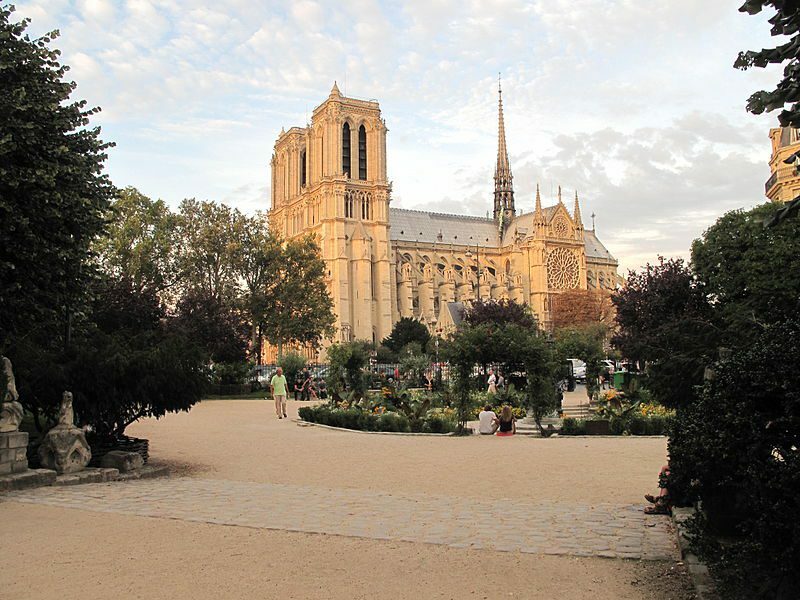 The Square Viviani outside Notre-Dame Cathedral is another poetic spot, especially in the mid-to-late spring when it bursts into color and bloom. Again, you’ll have to find a bench to perch on, but after a morning of sightseeing and visits you’ll still welcome the reprieve. Another of my favorite green areas is a recent discovery: the Square des Batignolles, nestled in the little-explored 17th arrondissement. Somewhere between park and square, it’s got lush greenery, wild birds and plenty of benches for picnics. 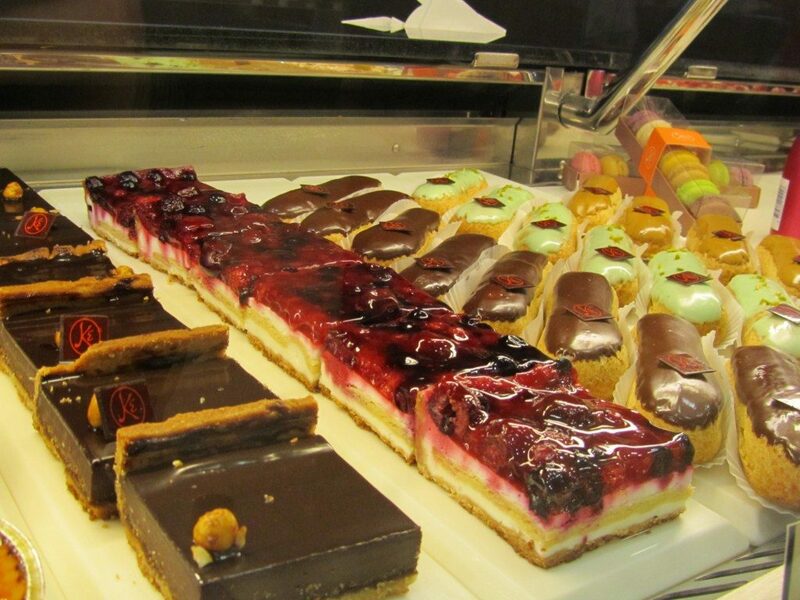 There are some excellent bakeries on the main streets outside the square, too, so feel free to stock up there. 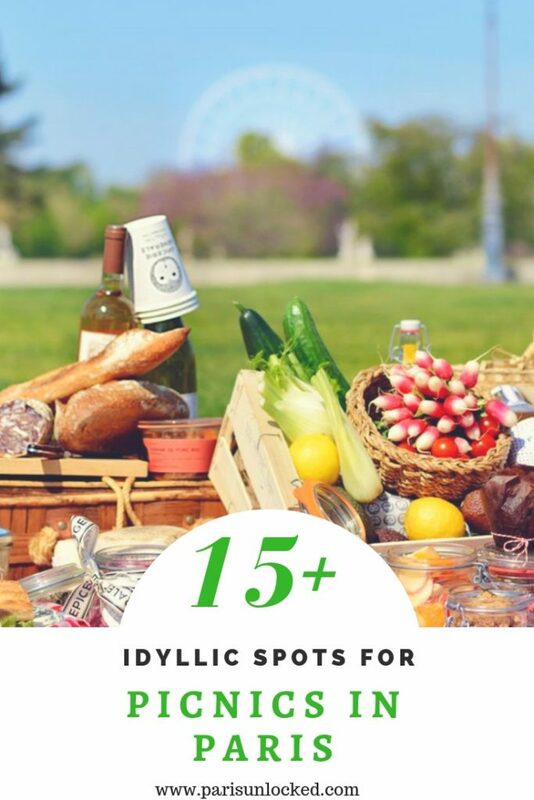 There are too many charming squares to comfortably count here, but you can find more potential spots for a casual picnic at this page. The truth is, you can stage a spontaneous picnic anywhere there’s a bench and a pleasant view. I recommend roaming around during your stay and having a spontaneous lunch, wherever calls your name. People-watching is yet another highly-developed yet casual art, so you can watch the world drift by as you enjoy a break from walking and sightseeing. Finally, you don’t need to stay within the city limits. 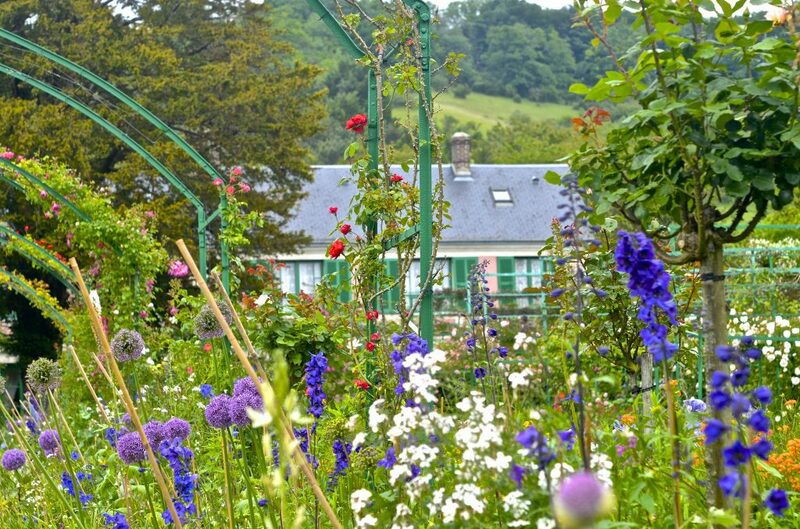 Take a day trip outside of Paris to nearby destinations such as Monet’s gardens at Giverny or the medieval town of Provins, and stage a picnic there. You can even hop on a half-day cruise along the Marne river and enjoy lunch on its picturesque banks. You may be surprised to find how affordable your adventure to a whole other town can be when you avoid expensive restaurant meals. Of course, the weather conditions have to be right. Even if your budget is tight, having a picnic is generally much less expensive than eating out at a restaurant or even ordering take-out for your hotel room. Here are some tips for homing in on the good stuff. 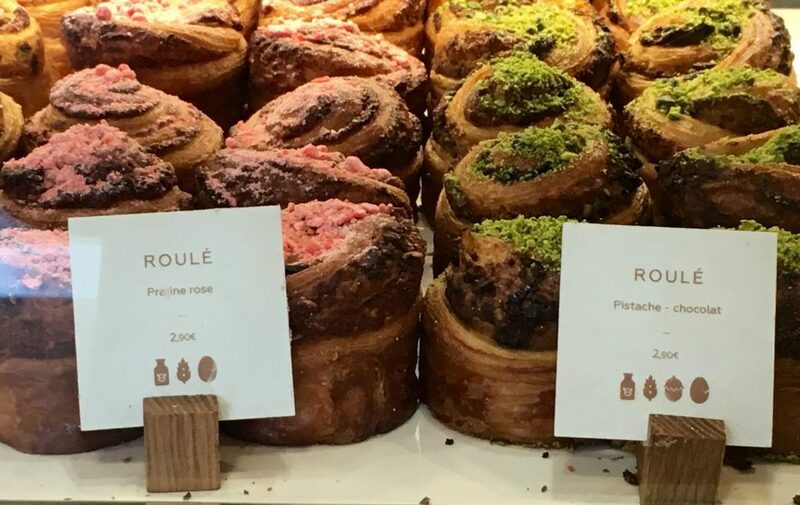 In a city where corner bakeries are as easy to find as supermarkets (if not easier), stocking up on items like fresh bread, pastries and mini-quiches shouldn’t be difficult. 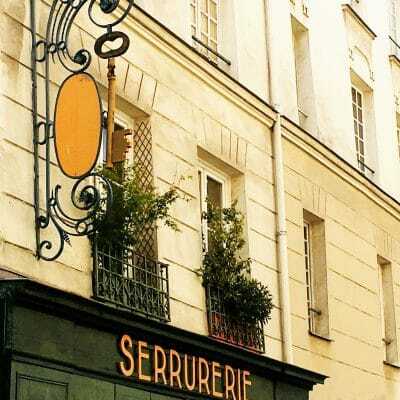 You can either try to locate a decent local bakery nearby with the aid of Google Maps, or see this useful list of quality boulangeries and patisseries by arrondissement (district). Simply figure out which district you’re in and beeline to one of these. Over at TripSavvy, I and my collaborators offer our own picks for the best bakeries and patisseries in the capital. The latter tend to be best for pastries and cakes, but some are excellent at both. You may be tempted to buy whole sandwiches from a bakery, which is fine. 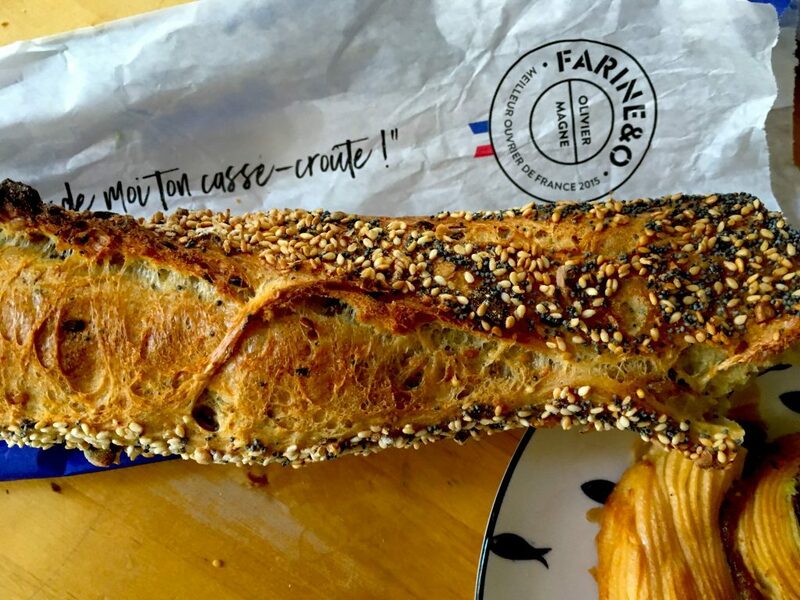 I personally think it’s more fun to buy a baguette or two and stock up on cheese, salad greens and other things from a food market. I’m also not a big fan of many French-style bakery sandwiches: they tend to lack seasoning and be over-drenched in mayonnaise. But those are just my tastes. A vendor selling heaping piles of fresh cherries and other produce at the Marché d’Aligre. Courtney Traub/All rights reserved. You can always head to a corner supermarket for items such as fresh cheeses and fruit, sweets and spreads. And you may well need to if you’re after goods such as hummus, yoghurt pots, wine or more specialized items. Monoprix, Franprix, Simply Market and Casino are typical local supermarkets where you can easily stock up on these sorts of things, and there’s bound to be one nearby. Tip: Buy a heavy-duty cloth or burlap shopping bag from Monoprix or elsewhere, and whenever possible use wooden cutlery and paper plates rather than single-use plastics for your picnic. 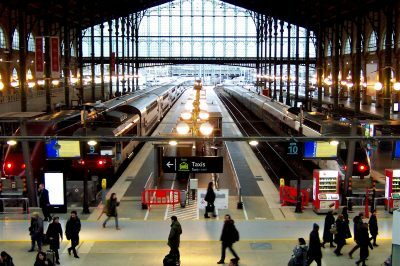 Parisians find it very gauche, these days, to generate harmful (non-biodegradable) waste. But if time allows, I strongly recommend a stroll through an open-air market. 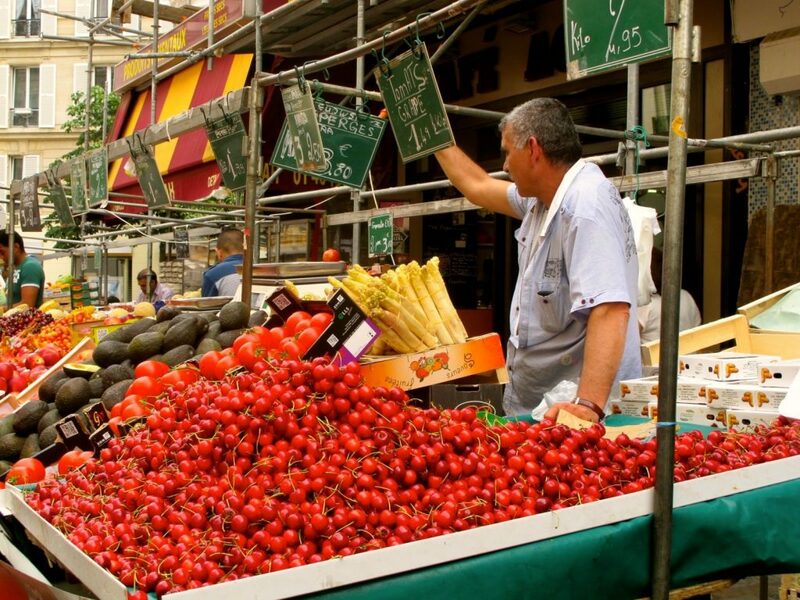 Ones likes the Marché d’Aligre and the Bastille market offer everything from cheese and olives to freshly baked bread, delicious seasonal fruit and pastries. And there’s plenty of local color and cultural experiences to partake in, too. See this guide to the best open-air markets in Paris to find one nearby. Sometimes you don’t have the time or energy to put together an elaborate picnic. Luckily, there are plenty of high-quality food stands and restaurants with takeout windows to beeline to. 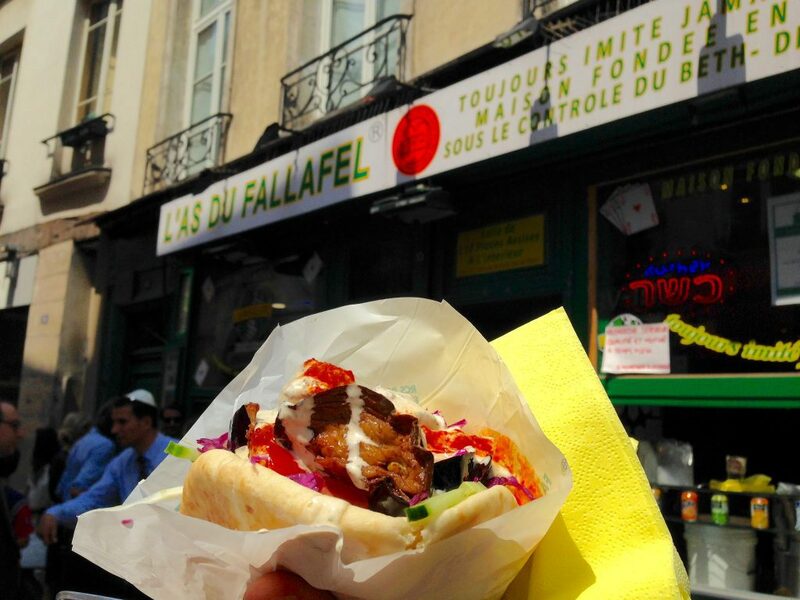 See my guide to the best street food in Paris for ideas on where to head. Also be sure to read up on my tips for avoiding tourist traps in Paris: You don’t want to end up feasting on lousy sandwiches or crepes, after all. 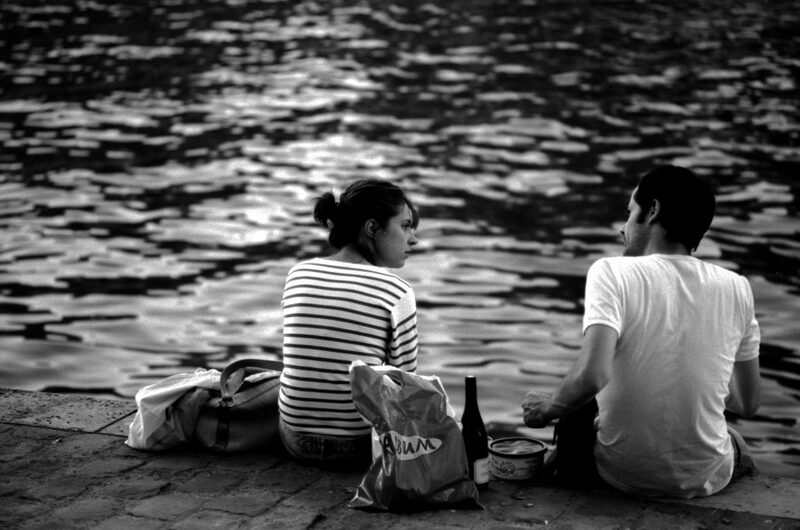 Many people wonder whether it’s legal to drink in public in France, including in parks and gardens or by the riverside. The answer is a bit complex. Technically, you aren’t supposed to consume alcohol in certain public areas, or risk fines. But it’s not always clear what those places are, and it’s usually up to municipal and local authorities to make the call. It’s also illegal to be “manifestly intoxicated” in public. In other words– drinking in public is not banned in France (outside of specific ordinances), but being obviously drunk is. Keep a low profile and don’t be obnoxious, aggressive or rowdy. 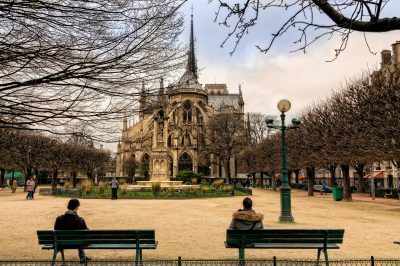 In practice, it’s rare for authorities in France to penalize picnickers for drinking moderately in parks and other public spaces. Make sure not to over-consume or display rowdy behavior, and you should be fine. I’d also avoid drinking hard liquor in public, as this tends to be frowned upon and may be seen as excessive. Of course, if you’re not comfortable with taking the small risk of getting fined for drinking during your picnic, don’t. I’ve enjoyed wine or beer at countless picnics over the years in France, and never once had a problem. I haven’t heard reports from friends of being approached by authorities about this, either. This leads me to conclude that it’s safe to drink a glass or two during your picnic. You’re probably more likely to get a stern warning for sitting on those forbidden and hibernating lawns!